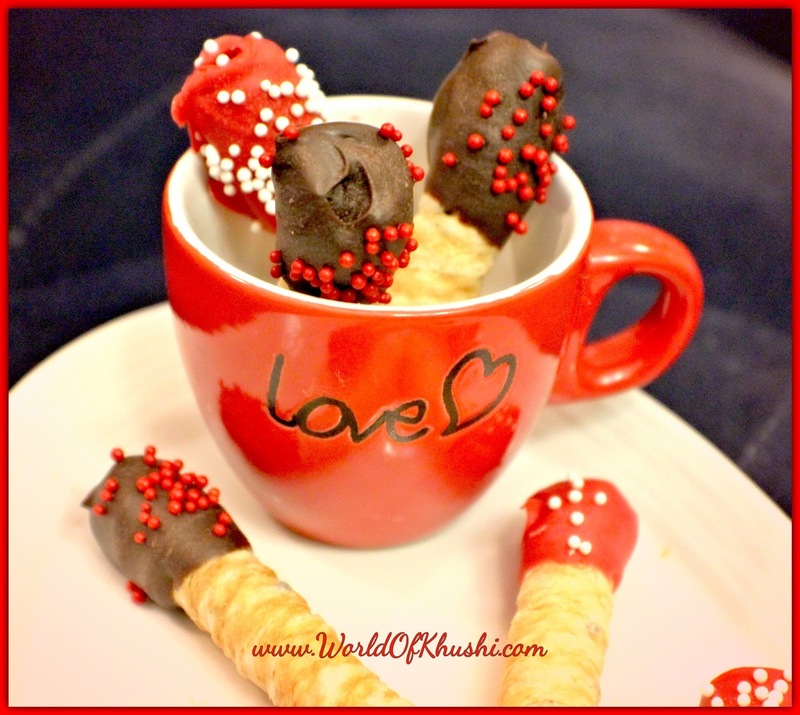 Chocolate Recipe is must when it comes to Valentine's Day, specially Chocolate Dip Recipes!! Although sometimes we don't want to go unhealthy and still want to enjoy sweet treats. In today's post we are going to make Chocolate Coconut Rolls. 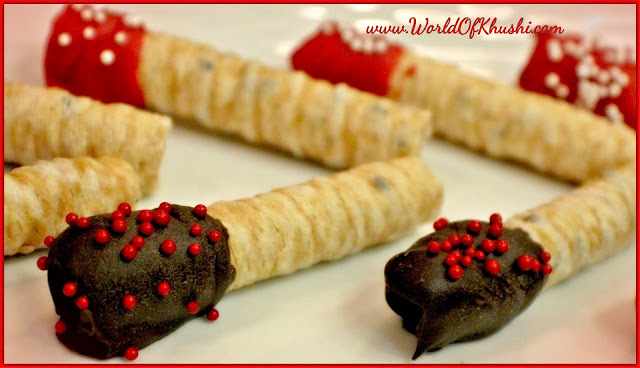 Here we will use Coconut Waffle Rolls which are little healthy option and Dark Chocolate as it is much better option. If you don't like Dark Chocolate then you can use Milk Chocolate too. I am using Less Sweeten Milk Chocolate in Red Color. Let's see how to make it!! To buy the same Coconut Rolls we used click here. Step 1. By using Double Boiler Method; melt both the Chocolates (Red and Black) in the separate bowl. You can even Melt the Chocolate in Microwave. For this Recipe I like to use Double Boiler Method. Step 2. 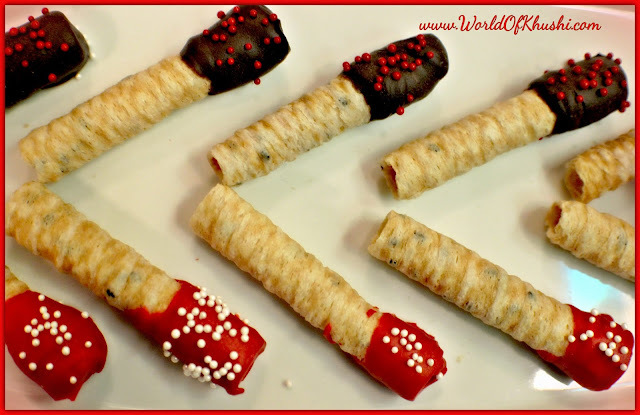 Once the Chocolates are melted properly, dip Rolls one by one. Step 3. Dip only one side of the Roll and place it on top of the Parchment Paper. Step 4. While the Chocolate on the Roll is still melted, add Sprinkles on top of it. Step 5. Repeat the same for the other Chocolate. Step 6. Leave it till the Chocolate is completely dry, around half an hour. Your delicious mouth watering Chocolate Coconut Rolls are ready!! You can store them in air-tight container. These Rolls taste so good after adding Chocolate. Do try and share your feedback with us. What is your favorite Chocolate Recipe share with us in the comments section. 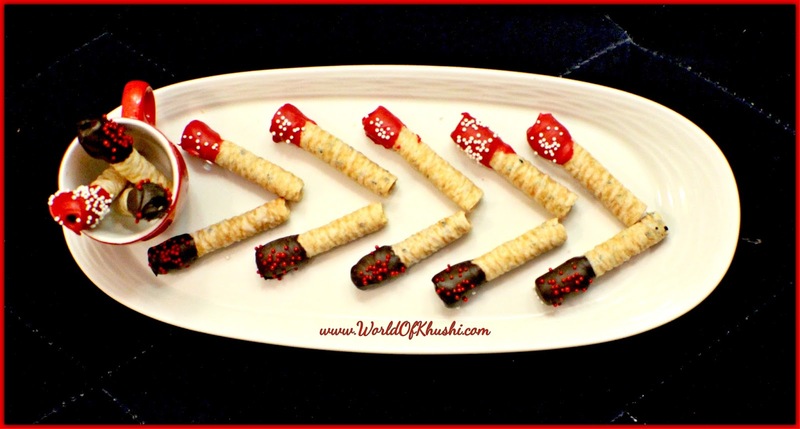 I hope you people like this Recipe and for more such easy Recipes stay tuned with Khushi's World. Please share some love and support by liking and sharing our Posts! !